Don’t miss the Smart & Final Ad Deals, valid April 17 – April 23, 2019. 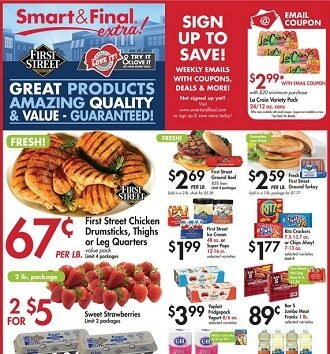 Browse the latest Smart & Final Flyer Sale, and no-membership club sized grocery offers & promotions. Find great savings on baked goods, beverages, dairy, eggs, breakfast products, canned foods, beauty products, condiments, cleaning supplies, fresh meats, seafood, pet supplies, fresh produce, snacks, equipment & supplies or Farmer John Pork Picnic Roast, Preserves & Peanut Butter, Sun Harvest Organic Items, Spring Water, and more.